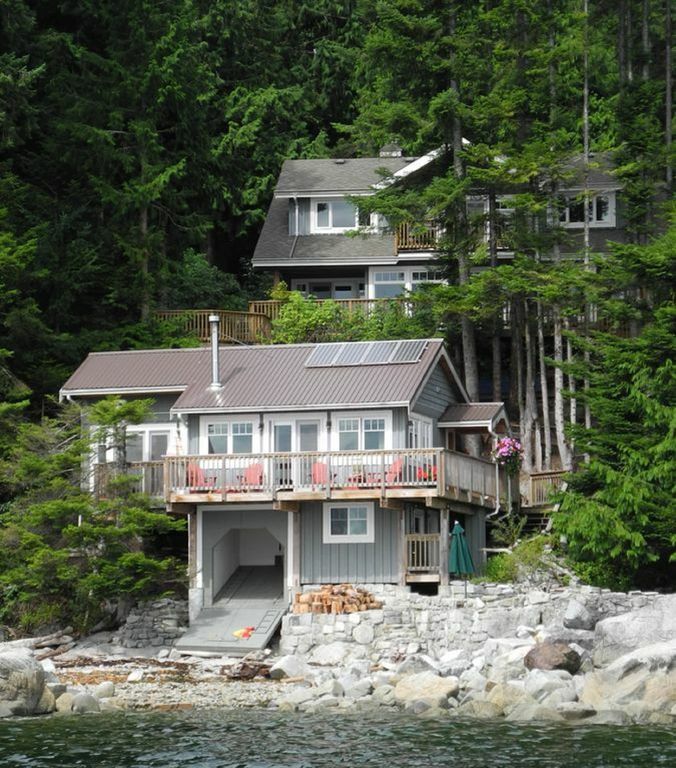 Welkom bij Stillwater Beach House, gelegen op mooie Frolander Bay in het Stillwater gebied ten zuiden van Powell River, BC We zijn aan het water, ligt verscholen tussen torenhoge groenblijvende bomen met een prachtig uitzicht Malaspina Strait en Texada Island. Ongeacht het weer, de omgeving is werkelijk prachtig op alle momenten van het jaar! Dit gezellige uitje is een 'milieuvriendelijk', zelfstandige strandhuis met de oceaan op slechts een paar meter verderop. Het is een ideale locatie waar u kunt ontspannen en genieten van de vele outdoor-activiteiten dit prachtige gebied te bieden heeft. Het is een prachtige plek om tijd te genieten met familie en / of vrienden! Moderne badkamer met comfortabel ligbad met uitzicht op het strand en een aparte douche. Het composteringstoilet is vervangen door een standaardtoilet. Warm water buitendouche, zonnepanelen en vele andere milieuvriendelijke voorzieningen ligt recht boven de oceaan. We stayed for four nights and it was incredible! So relaxing that it felt like we were away for a week. The property is super clean and has everything you need to be comfortable. The wood stove that is pre loaded so all that you have to do is strike a match is a nice touch on a cool evening. Christine and Jock are great hosts that go out of their way to make you feel at home. Breakfast supplies delivered to you for your first morning was another great touch! Our two teenagers are begging us to go back once a year and we hope to make that happen. Don't wait to book, you won't regret it! This is the perfect place for a peaceful retreat from the business of everyday life. The house is charming and cosy and well equipped with items you will need during your stay. The location on the ocean front is amazing, perched right on top of the water. The view is breathtaking and the absence of light pollution makes for incredible stargazing. The hosts, Jock and Christine are very welcoming and make every effort to ensure your stay is enjoyable. I can't say enough about how beautiful it is. The waterfront cabin is gorgeous, the view is incredible, Jock and Christine have paid attention to every detail in this place. Right on the water, it's a welcoming,cozy place to stay. We were looking for a quiet retreat and it was perfect! Hosts Jock & Christine went above and beyond-- I mean well-beyond-- taking care of us. They helped us get the car out after snowstorm, delivered it to ferry, fed us soup when we were running low on supplies. I can hardly wait to go back!! Top notch view and very cozy! We stayed for a few nights in november and had a marvelous time. We cooked the whole time we were there, the kitchen is great. We loved the sea lions, they swim right outside the cabin. Such a unique location due to its proximity to the ocean. Thanks so much! Highly recommend staying here if you want a get away to relax and see wildlife! This ocean front cottage is just lovely. We were greeted by both Jock and Christine, very friendly and welcoming, and shown around the cottage and area. The cottage is well stocked with everything you need. It was extremely clean and you can tell the owners take great care, keeping it in top shape and running order. The added touches of flowers, cushions and blankets make it very inviting. We were treated to breakfast makings for our first morning which is very thoughtful and after having being on the road for a while made our first morning there much more relaxed. Many thanks to Jock and Christine for making our stay in Powell River something we will happily remember and we hope to be back in the future. This was a perfect stay for a restful vacation. We watched the sea lions and listened to them roar. The seals came up for breath right by the deck and I even saw a whale spout! We were warmly welcomed and well taken care of. We are most happy that you all enjoyed your stay in our Beach House and found time to relax. We appreciated having you here and enjoyed interacting with your fabulous dog! Thank you for treating our home with care and your kind words. Nauwe toegang tot Sunshine Coastal Trail hutten, kano / kajak op de oceaan en de meren en op zeer korte afstand van Desolation Sounds en Prinses Louise Inlet boottochten. Rates are subject to change until booking is confirmed. Rates are based on two guests. Additional adults (maximum 2) are $20.00 each, per night. Children 16 years or under no additional charge.